Birds of a Feather…Aliens of a…Tentacle? I’ve been enjoying Dawn Griffin’s Zorphbert and Fred, and I’ve been listening to her on the Webcomic Alliance podcasts. So I decided to do up some fan art of her characters, since we’ve both got aliens on the brain. 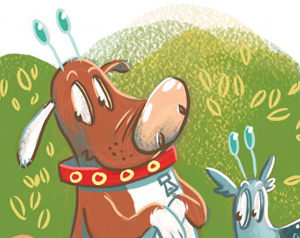 Her aliens just happen to be dressed up, pretending to be dogs, hoping to blend in while they study us humans. Pretty much the same mission as Ellie. I suppose if we can send little explorers out into the void to report back to us, we can’t be surprised when it happens the other way around! Go visit Dawn’s great comic (be nice to her. She has a cold). And check your pets for zippers! Click on the pic below to see the whole image at her website! aww, what a nice review, jim! Thanks! I’m contemplating a scenario to return the favor… drawing Ellie will certainly be a blast! You’re more than welcome, Dawn! I figure I owed you for the hours of info I’ve gotten from you on Webcomics Alliance. That and, well, they’re just so fun to draw!